Take a second to appreciate that we live in a world where toasty-gooey marshmallows are a de rigueur topping for buttery sweet potatoes on Thanksgiving. Now, accept that it gets better. Here, chefs and expert cooks share some of their best topping upgrades for Thanksgiving sweet potatoes. F&W’s Justin Chapple was inspired by Rice Krispie Treats to make a sweet, spicy and crunchy topping for sweet potatoes. Get the recipe here. For an extra hit of delicious fat, chefs Benkei O’Sullivan and Zene Flinn of New York City’s Park Avenue Autumn confit sweet potatoes with schmaltz (rendered goose or chicken fat). They then dust them with sugar in the raw before hitting the dish with a blowtorch for a brûléed effect. In Alexandria, Virginia, Brabo chef de cuisine Harper McClure grew up making marshmallows at home. For Thanksgiving, he flavors them with sage. “I wanted to pay homage to the tradition, but I also wanted to elevate it,” he says. Josh Habiger of Nashville’s Pinewood Social slices shiitake mushrooms super-thin, sautés them in small batches, then dries them in a low-temperature oven, which transforms them into a crispy, vegetarian take on bacon bits. After roasting sweet potatoes with apples, butter, cinnamon, bourbon, maple syrup and apple cider, chef Matt Christianson of Urban Farmer (with locations in Portland, Oregon, and Cleveland) tops them with deep-fried, puffed-up chicken skin. 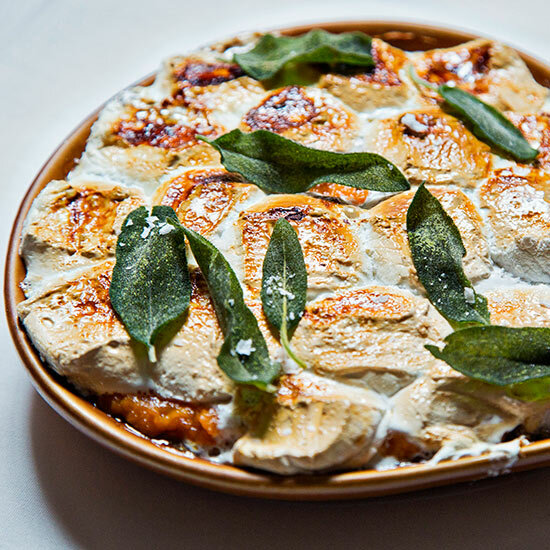 For an elegant marshmallow substitute, chef Julia Jaksic of Employees Only, in NYC, likes to top sweet potatoes with ginger-spiced meringue.